For future reference, I have appended herewith, the eight (8) Terms of Reference (TOR) for the Royal Commission of Inquiry (RCI) on Sabah's illegal immigrant problem announced by Prime Minister Najib Razak in Kota Kinabalu on Saturday, August 11, 2012. The Royal Commission of Inquiry will be headed by former chief judge of Sabah and Sarawak Steve Shim. The five-member panel has been given six months, to deliver it findings. To determine the number of immigrants in Sabah that have been given blue identity cards or identity cards or citizenship and if so whether these documents or citizenship was done legally. To investigate whether the issuance of blue identity cards or citizenship to immigrants in Sabah was in accordance with the law. To investigate whether immigrants in Sabah holding blue identity cards, temporary identification receipts (blue) or citizenship documents had been illegally registered into the electoral rolls. To probe whether the authorities had taken any action or carried out any improvements to standard operating procedures (SOP), measures and regulations to avoid any infringement of the law. To investigate in detail the SOP, measures and regulations relating to the issuance of blue identity cards or citizenship to immigrants in Sabah by taking into account international standards and norms used in Malaysia and to recommend any amendments or changes to strengthen or improve the SOP, measures and regulations. and their impact on the electoral roll. To investigate the social implications of the issuance of blue identity cards or citizenship to immigrants in the state on Sabahans. To determine the number of foreigners in Sabah who have been given blue identity cards or citizenship by taking into account their stateless status. Steve Shim Lip Kiong - The commission will be chaired by former Chief Judge of Sabah and Sarawak. Saripuddin Kasim - Domestic Trade, Cooperatives and Consumerism Ministry secretary-general. 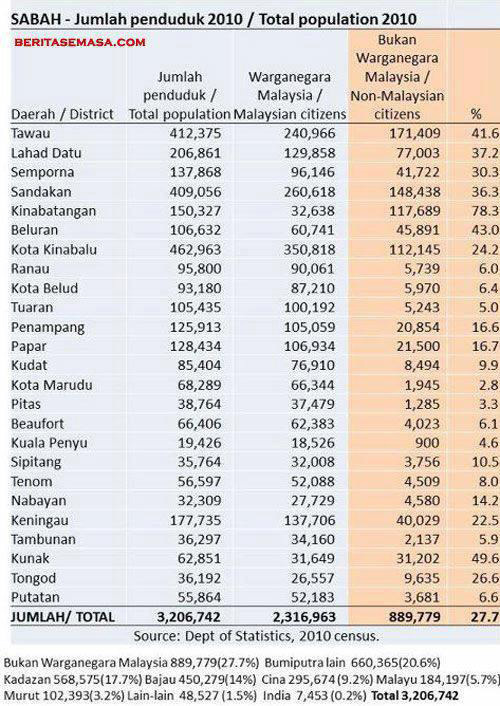 This (image below) is the population of the state of Sabah obtained from Department of Statistics Malaysia, which appeared in my previous article. This has been the subject of hot debates among politicians and the general public for many years now. Let's the law takes its course and hope for the best.